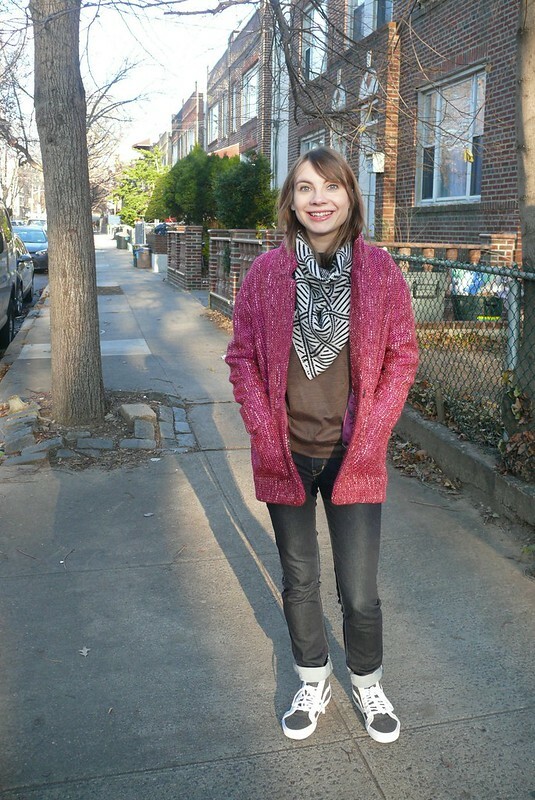 Ginger Made: RDC Gerard Coat!!!!! 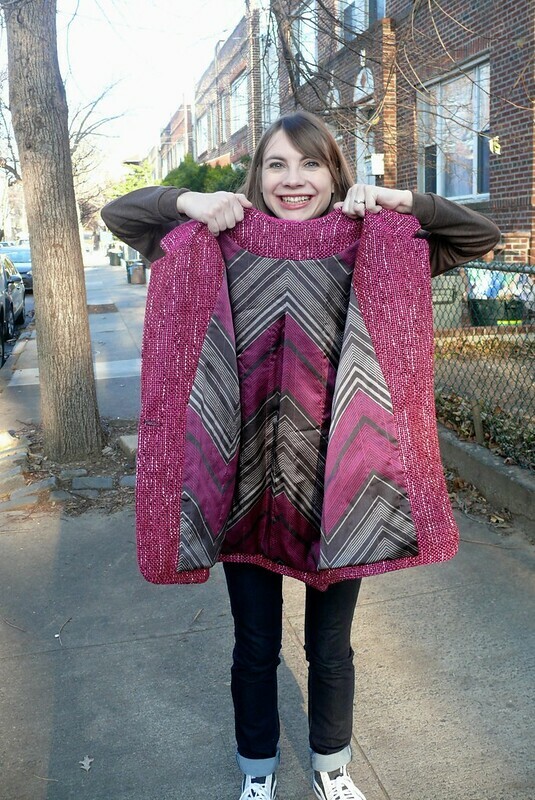 You guys you guys you guys it’s a fuchsia coat!!!! Please pardon the idiotic levels of excitement… it’s just that I’ve been working on this for ages and it’s finally done! I knew that I wanted to try a coat in this silhouette when I first saw one about a year ago. I’d planned to make one last spring, but couldn’t quite get things together, so I was determined to make one this fall. Well, it’s my December Mood Sewing Network project, but, I mean, December is almost fall, so, better late than never. But I’m glad I got it done now as we’re having a patch of milder weather and I’ve gotten to wear it this week, yay! 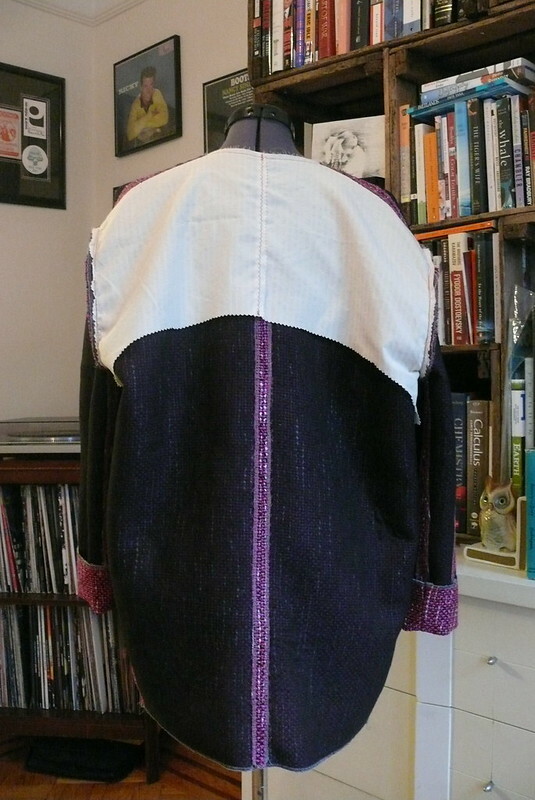 I used République du Chiffon‘s Gerard coat, a pattern I’ve had my eye on for some time. It’s a style that I’m really into lately and have been quite anxious to try out, plus every version of this pattern that I’ve seen pop up online has made me want my own even more (check out Jolies Bobines‘ three versions!!!)! However, I should tell you right away that there are some things you need to know if you’re considering this pattern. First, the instructions are minimal and the translation isn’t perfect. There are two steps that aren’t translated at all, so you have to find your own way if you don’t speak French. Second, if you aren’t a person who’s really into PDF patterns, you’ll probably hate this one. The pages didn’t match up very smoothly for me, so I had to futz and futz with them to get them to line up. It’s been ages since I printed this out, so it’s possible I could have had a setting wrong or my printer was acting up… I really can’t say! But once you’ve printed out the PDF, you have to trace it because the different pieces are printed on top of each other (like a Burda magazine), THEN you need to add the seam allowances. Ugh! The seam lines didn’t match up correctly, so I had to fix or ease them so they would match up (probably exacerbated, if not caused, by the fact that the PDF didn’t match up). Also, the pattern pieces are hand drafted and they’re named and numbered by hand and in French, so you need to refer back to the cutting chart in the pattern to make sure you know which piece is which. It also helps to re-label the pattern pieces with the more common English terms (“top of inside facing’ = back neck facing, for example) so you don’t get confused. So, this pattern isn’t for the faint of heart and requires a bit more effort than most. But on the plus side, it wasn’t very expensive (I caught a 20% off sale in the Kollabora shop, so it only cost $8, a good value for someone like me who doesn’t have access to cheap Big 4 pattern sales in chain stores). And the style is exactly what I wanted, so, for me, it was worth it to use this pattern, even if it was a bit of a headache at times. The fabric I used is a cotton/nylon bouclé from Mood Fabrics NYC that I bought wayyyyy back in March when Clare was visiting and we had a big group of sewers gathered together at the store. 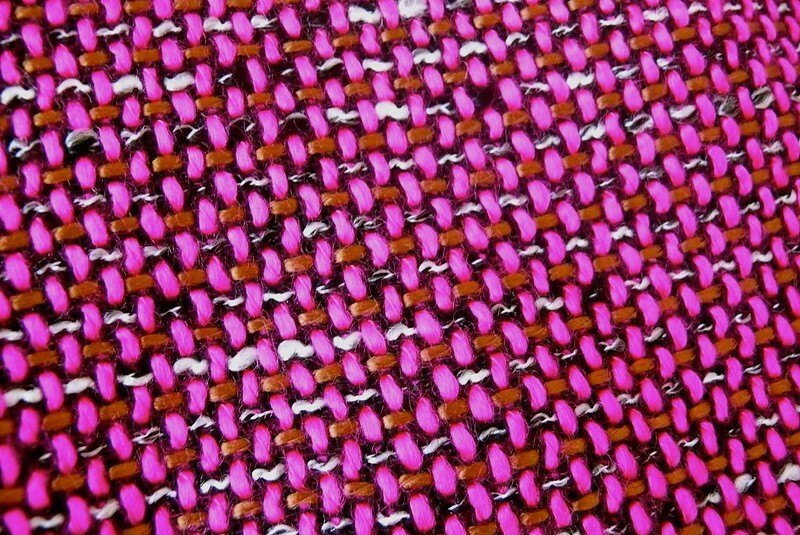 In the spirit of full disclosure, I should mention that I was WAY over-caffeinated and overexcited that day, so when I saw this bouclé with neon pink running through it, I lost my mind completely and bought three yards of it without even the slightest idea what I would do with it. I really find it odd that I bought it… it’s a weird color for me and I’m not sure what I was thinking. Let’s just blame this on Clare’s intoxicating presence! I used a total of two yards for the coat. The lining and interlining were bought with this month’s Mood allowance. The lining is a stretch charmeuse, not something I would normally choose, but it was a perfect match to my outer fabric, so I had to have it! The interlining is a Theory wool-blend flannel, which I thought would add warmth without losing too much drape. I used 2.5 yards of lining and 2 yards of interlining. I knew my big struggle with the bouclé would be to contain the fraying. Fusing all the pieces helped, but I also serged around every single piece for added security after this was suggested to me on Instagram by Brooke, Aunty Maimu, and Amanda. To recap, I cut out every single pattern piece in both the main fabric AND the interfacing, fused them all together, cut MORE interfacing for the parts that needed a heavier one and fused THOSE pieces again, THEN serged all the edges of each one of these pieces. This took approximately 9,853 hours. The other difficulty with this fabric was that, because it’s a cotton/nylon blend, it’s not a huge fan of the iron. I had to keep the heat low and use a press cloth, but try to get the fusible to adhere to the fabric. And as you can imagine, with fabric that doesn’t want to press well, the seams didn’t want to stay flat, so I had to catch stitch them all open. This was tedious, but really improved the look of things. Also, it didn’t even cross my mind until I’d finished sewing the whole coat that it would be impossible not to snag a bouclé coat on e v e r y t h i n g. Any tips for avoiding/fixing this??? I decided to work in a different order of operations than I usually would and construct the lining first to get it out of the way. Now, clearly I’ve been spending too much time around Puu and her little French jackets, because I found myself wanting a quilted lining! [Sidenote #2: I owe 1000 thanks to Puu for giving me SO many helpful suggestions, answering all my tailoring questions, and generally talking me off the ledge when I got overwhelmed and wanted to abandon the project. I couldn’t have done this without her expertise and cheerleading!] First, I cut out my interlining using the lining pattern pieces. Then, I chalked lines parallel to the grainline, 2″ apart across the width of each pattern piece, and quilted the lining to the interlining along those lines. 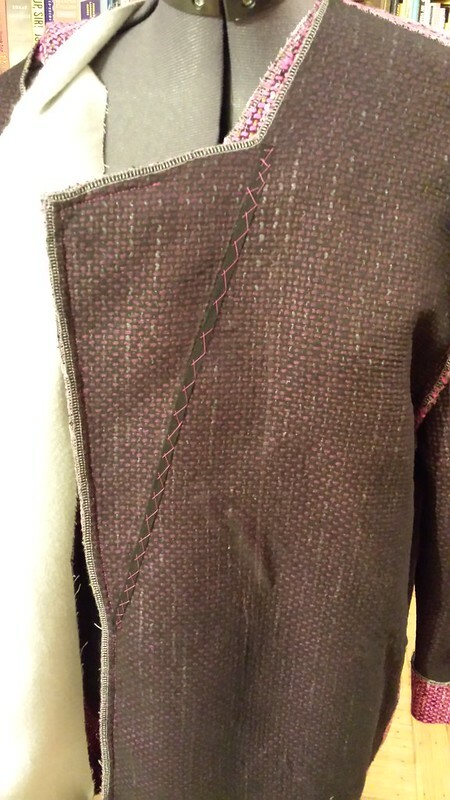 Finally, I stitched all the way around each piece, just inside the seam allowance, to keep everything together. After that I assembled the lining the way I normally would, but, just like the shell fabric, the seam allowances didn’t want to press open nicely, so I had to catch them all flat. This was lots of work, but I really like the feel and functionality of the quilted lining, and I’m sure I’ll do it again! Since I was already going a little overboard with this project, I decided to add a back stay (they’re used to stabilize coats through the shoulders). I used a bit of cotton shirting left over from my first Hazel dress and followed Tasia’s tutorial. Hopefully this will help Gerard stand up to lots of wear! I didn’t follow the pattern instructions for the lower facings and instead stitched them all together to form a lower facing unit that I sewed on in one fell swoop. I also changed the construction order a bit so it was closer to what I was used to (shoulders, side seams, sleeves, facings). Since I wouldn’t be able to go crazy steaming the collar and lapels, it seemed important to tape the roll line so everything would roll over nicely. 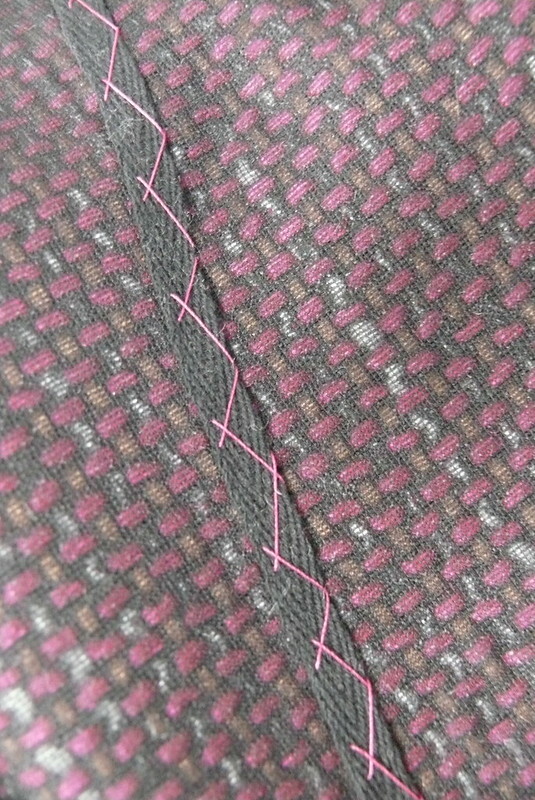 I cut twill tape a bit shorter than the length of the line and eased in the excess, which helps the lapel to roll, then I catch stitched it in place. Lisa has a great tutorial showing how to do this here! I wasn’t very sure how to find the roll line, so I assembled my shell first, then popped it on my dress form, saw where the lapel naturally wanted to roll, and chalked a line to mark it. Where I really got confused in the pattern instructions was sewing the notched collar. There’s one hand drawing and a series of steps in French, but nothing in English, and I’d never sewn one before. I spent about three days procrastinating because I reallllly didn’t want to tackle this step. I kept researching and researching and getting overwhelmed. Luckily, Angela and Kelly both recommended this YouTube video in their Gerard posts, and I ended up following it and having good results (OK, I watched the part about the notched collar, beginning around the 15-minute mark, about 7 times, and didn’t watch anything past that). As I sewed the collar, I catch stitched the seams open (the seam where the undercollar attaches to the back neckline, and the seam where the upper collar attaches to the facing). Then, to close the collar, I laid those two seams on top of each other and did a weird, loose catch stitch so they’re attached. Also, to properly sew a notched collar, you need to clip into the seam allowance all the way to the stitching line a few times, which terrified me, so I used Fray Check on the clips, and then got scared and went back and ironed a little patch of interfacing over them, so hopefully it won’t disintegrate! One semi-stressful thing about this pattern is that it doesn’t give you the placement for the pockets or buttonhole, probably not a huge problem unless you’re majorly indecisive like me. I waited until I had assembled the shell so I could try it on and pin things in place (the only downside to this was that it was hard to keep the facings out of the way when I stitched on the pockets!). I decided to do just one button, and placed the buttonhole slightly below the breakpoint on the lapel (the place where the lapel starts to fold back on itself… sadly, it’s completely different from Point Break and has nothing to do with bank heists or meatball sandwiches). I angsted for the longest time about the pocket placement, but ended up with them about 3″ from the bottom of the hem and 2″ in from the side seams. I’m pretty happy with this, but I think the button looks a little dopey and should be a few inches lower. Ugh! When I inserted the lining, I reviewed Grainline’s bagged lining tutorial since it had been a while since I’d last done it. I mostly followed this, but I also referenced the step-by-step photo tutorial for RDC’s Michelle blazer, since the lower facings were the same style. Also, Jen tells you in her tutorial to attach the lining to the shell at the underarm using a thread chain, which I forgot how to do, so this Susan Khalje Threads video was helpful. Guys, I didn’t make a muslin for this. Idiotic, I know! For some reason after I’d gotten all my pattern pieces ready, I dove right into cutting the fabric. I almost wish I’d cut a size larger so this was slouchier (like Kelly did), but maybe that would have overwhelmed me. Dunno! I could use a bit more room through the hips, but this is totally wearable. The whole time I was making this, I was really unsure about how the project would turn out. It felt like it had the potential to be a colossal failure! But, now that I’m done, I really like this coat! It’s not perfect, not even close, but it’s definitely workable and you know what? I just feel happy traveling around in a cloud of neon fuchsia! I’m usually pretty nitpicky about issues in garments I’ve made, but the imperfections sort of fade away when I wear this. It’s just a happy coat. Yay! So tell me, what are you sewing these days? Making any outerwear? Holiday outfits? Do tell! « Giveaway: Vintage McCall’s Notebooks & Cards! Oh Sonja…what a labour of love this was! But SO worth it in the end…the style is just perfect on you…and that colour! Swoon! Thanks, Marie! Now… some easy sewing! 😀 I need a little break from details and concentration! WOOOOW. what a process. I don’t envy you…it sounds like it took a million years!! But that coat is to die for!!! I love the boule! That hot pink is so amazing. I am super impressed with your making skills. Ooh, sounds like those will be great gifts! I bet the parents will love them. And a holiday peplum sounds really festive! I bet you’ll look awesome at your parties! Wow – this sounds like it was so much stress and work – I am so glad it turned out. It looks fabulous on you and I love love love the colour! I would have went bonkers for it too without the caffeine high! And that lining looks fabulous!! You are amazing! Cute!! I love it, it really turned out well. I’m loving that lining fabric too! Thank you, Haylee! I’d love to see what kind of coat you would sew… I know it would be cute! I love this coat, and that lining? totally swoonworthy! I don’t think it needs to be bigger at all, it looks perfect on you. Love your big cocoon coat! Beautifully sewn too, the bagged lining and attention to all things underneath have paid dividends. Oh goodness, I LOVE it! It looks so cozy! The insides look so well put together as well. Be proud of yourself, it’s amazing! Thank you for taking us on your coat making journey. I’m in awe over how much work has gone into this and it shows. You have a stunning coat. I have the same pattern and am more determined to make it now. Oh, yay, happy sewing! It all turned out well in the end, and if you choose an easier fabric than I did, you’ll have a lot less work to do. I’ve learned my lesson on that one! Thank you very much! It’s really fun to wear an unusual color… I should do it more often! Gorgeous!! I am amazed by that detailed process you followed… Well done!! I might make a coat one day! But for now in the Southern Hemisphere I’ve got some swimwear to sew!!!! It looks startlingly beautiful to me, great fun to wear, and you obviously love it. The button placement looks perfect too. Any lower and it would have given you a paunch. I can guarantee this as I wore the style the first time round in the 80s. Hahaha, glad I avoided the paunchy look, then! Thank you! You’re coat is beautiful and absolutely amazing! You invested so much time and effort into it and it shows! You did a wonderful job on this and should be happy wearing it!!! Thank you, Charlotte! A coat for the boyfriend??? You’re so generous!!! Happy sewing! You can do it! You will make a beautiful jacket! Oh man, I was bored out of my mind fusing it! But now I’m thinking about making another one, too! I guess they’re addictive! I’m really grateful to you for compiling all the resources you used- your post was so helpful to me! I’m so glad you made this coat, and made it work! It’s so cute and cheerful on you – hope it gets lots of wear before the super cold weather kicks in this winter! I love this! 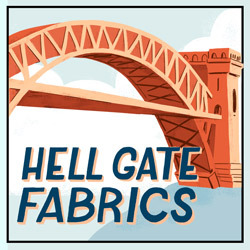 That fabric is amazing and your construction is superb. I have another coat ready to go too, in the New Year. Have a great holiday! I’m planning another one, too! This pattern is addictive! The coat looks great on you and the lining really gives it a nice finish. I am yet to make a coat and when I get to it in Winter (it is summer in Australia) I’ll come back to this post for some of those handy tips and hints. About PDF patterns, I will avoid printing out ‘print at home’ patterns if I can. My ink is expensive and I’m not good at matching pages anyway so I match them up in illustrator to make up a ‘copy shop’ version. It takes a while to add all the pages in and then match them up but probably less time and headache than doing it manually. Ooooh, that’s a great idea! Thanks for sharing! Copy shop printing is expensive here in NYC, but spending all the time putting together sheets of paper is really not fun! I love the jacket girl!! Your coat came out really nice and I am loving the wild lining. Omg, your face looks lovely, like seriously. Glowing. Trice, you are too sweet! Thank ya, lady! Thank you, Tasha! I’m excited to see your coat- knowing you, it will be amazing! Awesome coat Ginger! Fab colour combo too. Oh man, I see this one barely made the top misses of 2014 charts, but it’s a phenomenal piece of work! I’d feel proud of all the processes you mastered to get this finished. Amazingly well done! You did such a great job! And you chose such a magnificent color! I like the lining as well! OK I must say I’m in love with your coat! 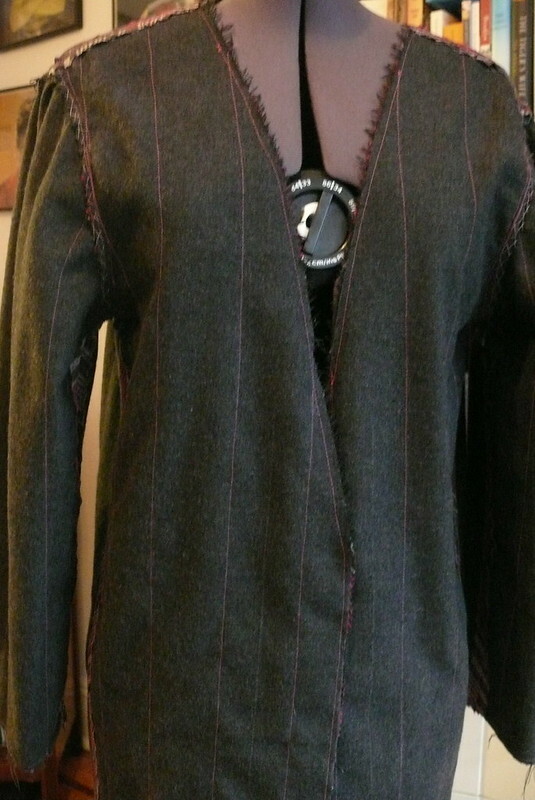 I’m not convinced yet if I’d like to make one myself…probably the man’s cut don’t call me for making it, but who knows! Bravo again! dude. i can’t remember if i commented when you first posted, but i just read this again. what a great freaking post. this is my favorite book of 2014. I loved the description of how you made it and will download the pattern. Great post! Thanks, Sarah. I’m so glad this was helpful! Hope you enjoy sewing the coat! It’s pretty fun- in fact, I’m working on a second version!